The Disbandment of the Regiment. During the political negotiations associated with the creation of the Irish Free State separated from the United Kingdom it was agreed that the Irish Free State was to develop its own Military Defence Force, limited to a size equal to the of the (Southern) Irish Regiments of the British Army. This introduced the dilemma of existing Southern Irish soldiers serving in a British Regiment and the fact that the British Army had regiments whose soldiers were primarily recruited from specific areas in Southern Ireland; a situation that could not continue once the Irish Free Sate came into being. This conundrum affected not only the Leinster regiment, but also the Royal Irish Regiment, Royal Irish Fusiliers, Connaught Rangers, Royal Munster Fusiliers and the Royal Dublin Fusiliers. 6th December 1921 the civil agreement in Ireland included a provision to disband the Irish Regiments which were recruited in Southern Ireland. 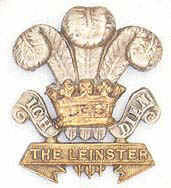 11 March 1922, The disbandment of the Leinster Regiment in its entirety is announced and the 1st & 2nd battalions were ordered to return to the UK. 29 March 1922 the 2nd Battalion arrive at Colchester to await demobilisation instructions. Soldiers wishing to continue in service were permitted to transfer to other regiments of the British Army. 18th April 1922 the 1st Battalion returns from India and move to Chatham to await demobilisation instructions. Soldiers wishing to continue in service were permitted to transfer to other regiments of the British Army. 12th June 1922, Monday, 11.30am the Regimental Colours were 'laid up' at St. George's Hall, Windsor Castle, to be kept forever in the care of The King and his descendents.